Summary: Ares is the seventh book in O’Connor’s very successful Olympians series of graphic novels. In fact, I was amazed to see that we’ve already gotten to book 7, because that means I’ve missed quite a few in the middle. For those who are interested, we featured the first book, Zeus (reviewed here), and last year we hosted a guest post from the author in honor of the publication of Aphrodite, which was book 6. I’ve already talked endlessly about my love of Greek (and all other) mythology, so I won’t go into that. But I do want to say that Ares was never my favorite character of the bunch. In that respect, I suppose he represents a side of humanity that I relate to less—the warlike, gleefully conquering, savage side. (Ironic, since my zodiac sign is Aries.) 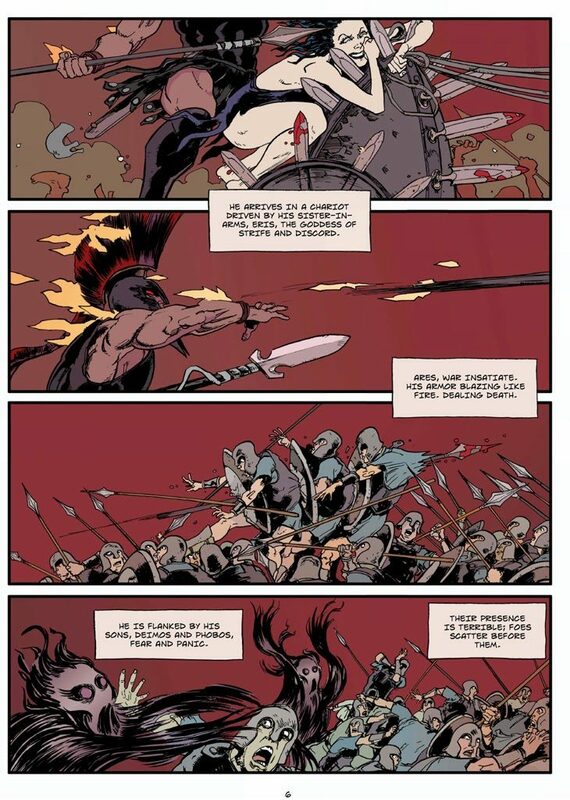 So I was interested to see how O’Connor handled his story, especially given that all I remembered clearly of the stories from my mythology book was something about Ares sowing the teeth of some monster in the ground and reaping a crop of fierce warriors. 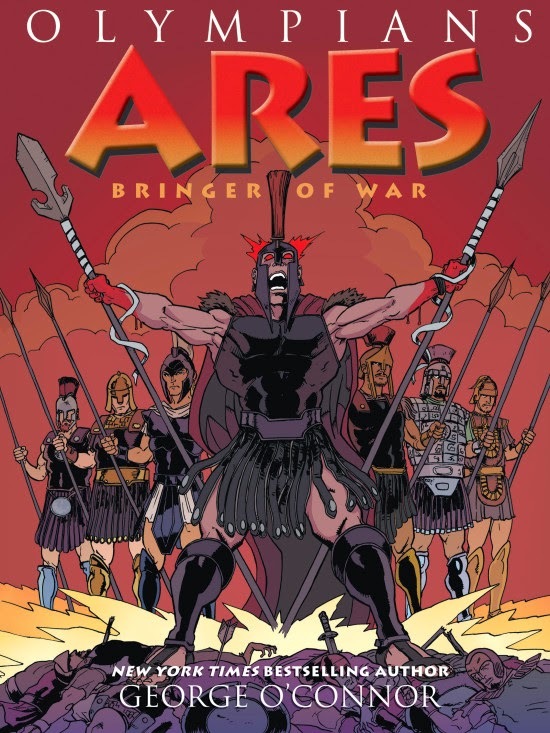 What the author does is quite clever: we get to see Ares in his element, in context, set against the backdrop of one of the greatest battles in history, the Trojan War. In the process, he comes up against his own divine cousin Athena, also a goddess of war, but of strategy and tactics, based on wisdom. Peaks: As the battle between the Greeks and Trojans rages, we see—from the gods’ vantage—the whole sorry escapade with Patroclus disguising himself as Achilles to rile up the troops and get them raging for blood, and then Hector killing Patroclus thinking he’s Achilles, and then Achilles going after Hector in a battle to the death. Yep, you’ve got it: it’s Homer’s Iliad. It’s a clever way to flesh out the story of Ares and really show him being a war god, and it’s also a fun way to show the gods in one of their many times of strife, their battle echoing the one on the ground and driving home the point that the Greek pantheon was anthropomorphic, reflecting human traits and preoccupations. O’Connor brings this all to life in a very readable, traditional comic-book style, with plenty of action but a minimum of actual gore, and little flourishes of anachronistic humor that the contemporary reader will enjoy. It’s got a high production value, and quite a bit of wonderful educational extras at the end (don’t miss the G(r)eek Notes for some entertaining glimpses into the author’s thought process), but at the same time this is a friendly, fun series that in no way feels didactic. From time to time, the flashing back and forth between the action at Olympus and the action on the ground had me a little confused, in terms of who was who and which gods supported which mortals, and so I had to fall back on my background knowledge of the Iliad to get it straight in my mind. Ultimately, though, since this is NOT the actual Iliad, it isn’t critical to have all those details straight in my head for the purposes of this book. Conclusion: Overall, this is another excellent addition to the series, and a fantastically fun way to get younger readers interested in Greek mythology. Mythology buffs like myself will almost always enjoy a new retelling, and this one sticks quite close to the original tales, so I can see the series being a great addition to either a home or classroom library. Now, if you’ll excuse me, I gotta go catch up on all those volumes I missed…but in the meantime, be sure to check out the other entries in this blog tour–including blog buds Charlotte, Mary Ann, and Mary Lee! Thanks to Gina Gagliano at First Second for organizing the celebration. I received my copy of this book courtesy of First Second. You can find ARES: BRINGER OF WAR by George O’Connor at an online e-tailer, or at a real life, independent bookstore near you!